Yes, Jupiter! I always muddle those! Was up around 3 am: clear sky but no Perseids. Went back to sleep, woke up when it was light. Perseid maximum is tonight thobut. 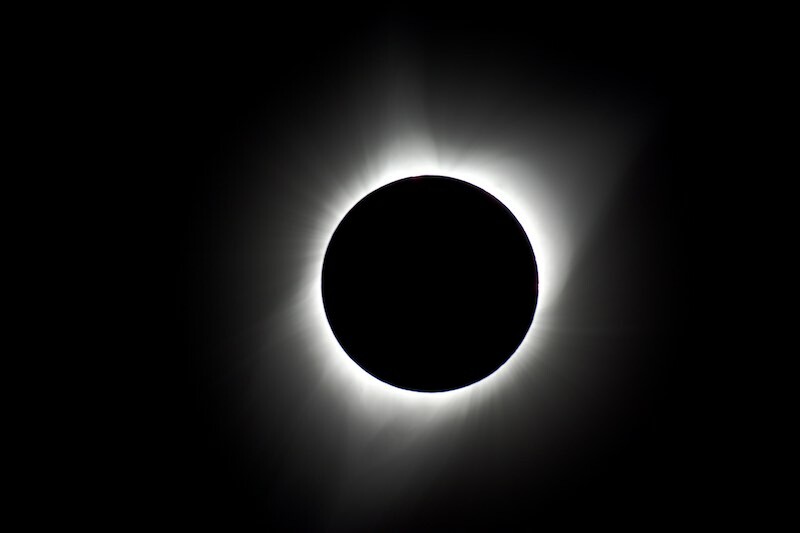 Apparently, a small Solar Eclipse was just observable yesterday from Stornoway, 19 years to the day since totality in Cornwall. Remarked yesterday to Mrs T42 that it was the anniversary of our eclipse party in 1999. We were right in the centre of the shadow in 1999. I had a scope set up to project & another with a thick Mylar filter for direct viewing. It was cloudy, but the cloud broke up about half an hour in advance and we saw it all. 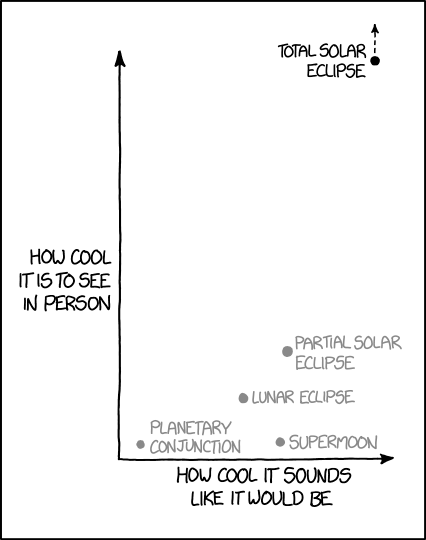 Funny: you can be as rational as you like, but a total eclipse is still kinda spooky. Yes. I cycle toured down to South Devon which was within the area of totality. You're right. It is spooky. The speed that the darkness fades in id just so un natural. Helly, wasn't it the thirteenth? Cloudy with a chance of Triffids tomorrow? Nope, it was the 11th. We saw a few meteors last night a couple of hours after sunset. Had another gander towards 3 am but Perseus was down the end of a brightly-lit street and looking that way was uncomfortable. Nowt visible. I'm always hoping for something on the Chelyabinsk scale, especially since the neighbours' modern monstrosity has great big plate glass windows. I should think that Swift-Tuttle's débris has been pretty well swept up by now though. Mrs T42 saw and heard a big one years ago in Uganda, which her parents poo-pooed until it was in the papers. I could have seen the 11th one if it hadn’t been cloudy, would also have seen the Perseids, but it has been unremitting cloud for a few days. In terms of anniversaries, it is nearly a year since this. Needs a dot for "blood moon". I have got me a new camera- Sony a3600 mirrorless. This beauty allows me to utilise the Sony Playmemories mobile app on my phone and iPad. As a result, I can link the device to the camera using the camera generated wi fi hub and veiw the image live. For astro stuff, this makes achieveing sharp focu so much easier. My first couple of astr efforts are below. Both shot at around 21:15 on 17/09/2018, ISO 1600. The first at 1/1600 sec, the second at 1/320 sec. Very nice. Makes me want to go out and spend money I haven't got. 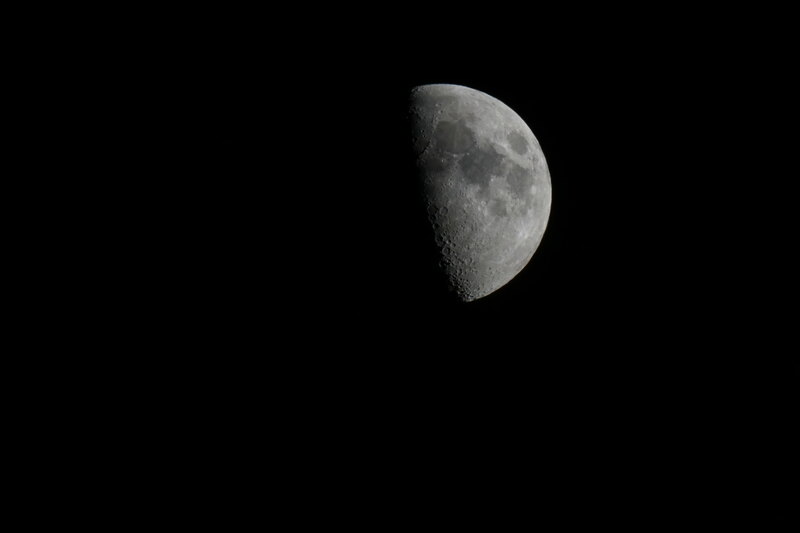 Tried the new camera out on the newly driven mount last night going interstellar. The back story is that I bought a drive kit for the Skywatcher EQ3/2 mount I got with my scope along with a polar alignment scope. Polar alignment (aligning the Right Ascension axis of the scope with the polar axis of Earth) is essential for trail free long exposures. To achieve this, you utilise a polar alignment scope which sits in the axis of the mount. The scope has a reticle which is lined up with Polaris depending on the year etc. Before attemting anything you have to ensure that the polar scope is accurately aligned to the axis of the mount. Aligning a polar scope to a mount can be akin to herding cats. Idealy done at night and using Polaris as your target you set up and level the mount, with the elevation of the mount consistent with the lattitude of your location (51 and a tad degrees for me) and ensure that the mount is correctly orientated re North. You then put the centre of the reticle on your target and rotate them mount around the RA axis 90 degrees (either way) or 180 degrees depending on your favourite tame experts advice. Look through the polar scope and note the distance and direction that the target has wandered from the reticle centre. Now make adjustments to the 3 grub screws in the polar scope (1.5mm allan key required on my scope) to shift the reticle half way back towards the target. Then using the mount fine adjustment screws, recentre the reticle on the target. Rotate back to start point and repeat until the target stays in the centre at both points. Alignment has been achieved. Bearing in mind that Polaris is quite high in the sky (find the Big Dipper- the two stars that form the 'wall' of the bowl furthes trom the handle form guide stars, a line drawn through these two stars, from bottom of bowl to top, extending about twice the distance between the two stars points almost exactly at Polaris), looking through the polar scope every minute or two for the eons it seems to take is neck breaking. Add in the fact that my polar scope isn't illuminated so red torch use at the objective end was required AND the buggeration factor of very small, dairy product related grub screws at night meant that I was about ready to kill someone by the time I had finish. 3 attempts it took Cat herding? pice of cake compared to that. Once you have the polar scope aligned you are ready to go. When setting up, you have to do your polar alignment. Not as awkward as polar scope alignment but still a bit of a faff. Deploy mount, level mount and ensure it is North aligned. Grovel on knees and check position of Polaris in relation to polar scope reticle. Adjust and repeat until aligned. Retire to the domicile and watch an episode of The West Wing and sup an hot coffee. 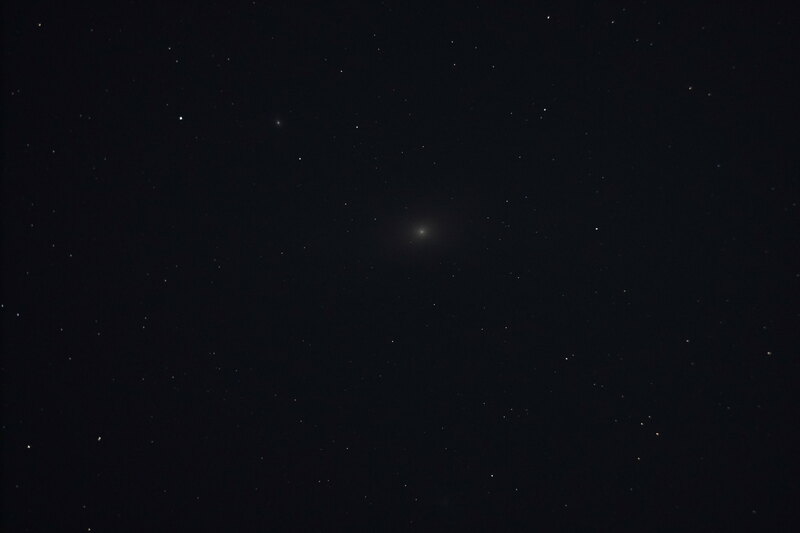 M31 is the nearest galaxy to ours and is about 2.5 million light years away (thiugh it is getting closer). I next had a look at Mizar. 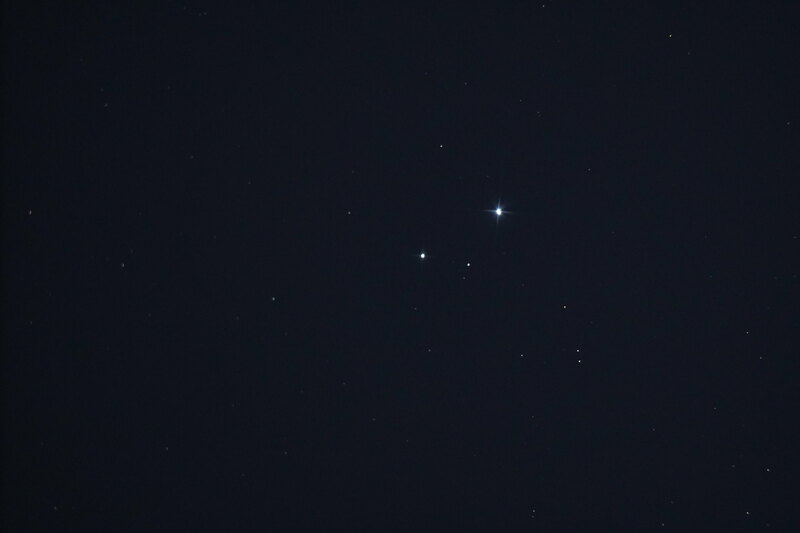 Mizar is the centre star in the handle of The Big Dipper. The reason I went there is because it is a double star in that it has a companion star (Alcore). Some folk can split the two with the naked eye. Mine are shot enough that I need binoculars to do so. Mizar is about 88 light years away. ISO1600 single frame 5 second exposure. Mizar is the brighter star, Alcore the slightly fainter. 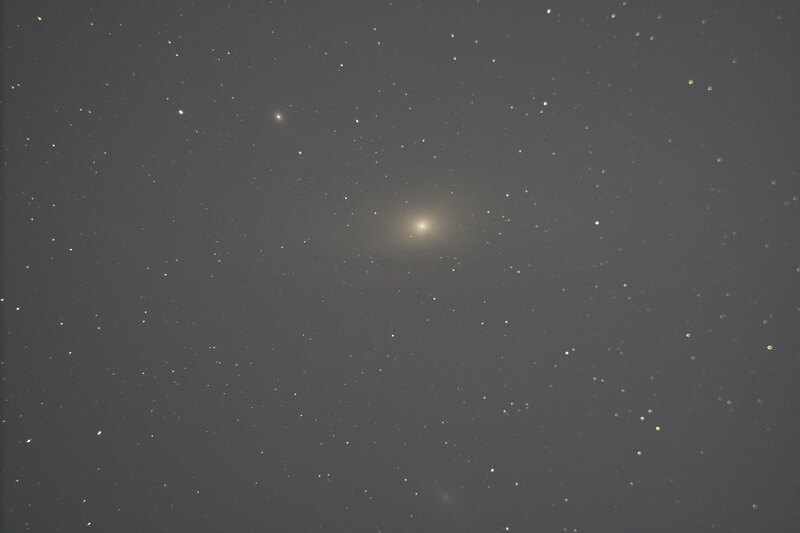 Last nights images suggest my scope alignment isn't perfect as some trailing is evident though not too bad. 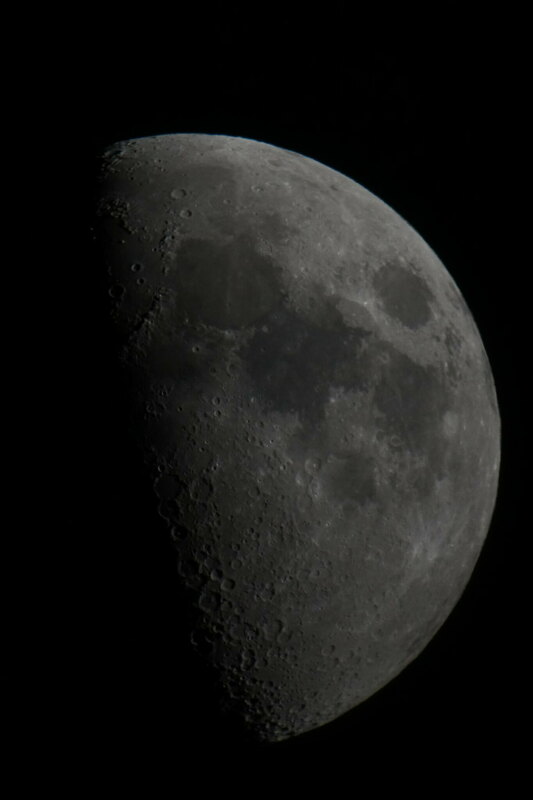 As I get used to the basic operating methods I will progress on to multi frame capture and stacking. i got kicked out of SGL for Bad Behaviour and can't go back. David's out too cos we use the same phone & internets. SGL is a funny place but v informative (by which I suppose I mean it gives me lots of ideas about how I could buy more astronomy clobber that I don't really need). The Parisian satellite town where I lived in 1980 had darker sky than the country village I live in these days. We had darker skies in Richelieu, where I did a choir school one year, than we'd ever seen in the UK. That's one of the small number of things I dislike about living here, namely the lack of a dark sky. Indeed, we can normally see stars out one side of the house due to bl**dy "security lights." Why do my neighbours need either to turn these full time all night, or set them up so they turn on whenever you look in their general direction. If you want a dark sky, we found that the cottage we rented overlooking the sea in the north of Skye (yes, yes) was the best I have ever seen. Indeed, the sky was so clear it was a little overpowering: I guess we can normally see a few hundred stars at most here in the Midlands. Up there, there were thousands and thousands I am sure I read somewhere that there are 6 000 stars visible to the naked eye. Is that right? The first time I saw the Milky Way was around 1970 from the Scout Camp near Romford.... I bet you can't see it now from there!! Yes. I sleep with my curtains open. When I first awoke at 6ish, they were shining in on me. Venus looked fantastic without my glasses on. An out of focus fiery thing. I'm no astronomer, but I thought that yesterday at dawn the moon and Venus were the clearest that I'd ever seen them. Thanks to the dog needing a walk. Didn't know Venus had a crescent though - but I suppose any planet will have, so thx for that. Venus must be past max. elongation already, and I've only seen it twice this autumn. Saw it this morning, though, beautiful as ever.